This morning, as I read the story in the Tri-Valley Herald (www.insidebayarea.com/trivalleyherald) about the Koopman Ranch and how the county’s ranching heritage is threatened, I couldn’t help but think that something very important was missing. Yes, agriculture is dwindling in Alameda County and ranches are disappearing along with wildlife habitat, but often forgotten is the loss of habitat for use by human hunters. A loss of our hunting heritage will insulate man further from contact with mother earth. Hunting is one of the most compatible uses for open space and wild places. We have very few of those places left in Alameda County. Unfortunately, a large portion of the remaining wild places are owned by agencies that have foreclosed on hunters. The remaining hunting spaces are more threatened than the kit fox, tiger salamander and red-legged frog. As agencies (primarily East Bay Regional Park District and San Francisco Water Department) close in on consumption of Alameda County’s remaining open spaces, they are signaling a death knell for Alameda County hunters who have worked hand in hand with ranchers to develop and protect wildlife habitat. Hikers and bikers use open space, but unlike hunters they don’t carry field glasses and sneak through the woods. Bikers speed by, unaware of their surroundings while hikers grunt at the weight of their load intent upon reaching their destination. Like the mountain lion, human hunters are acutely aware of their surroundings. 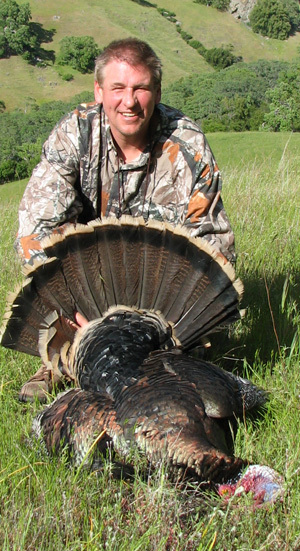 Both types of hunters are often misunderstood by those who don’t share in their pursuit. Aboriginal tribes appreciated and worshiped the hunter. In our modern world, the venison is not as important, but the characteristics that made those aboriginal hunters valuable to society are just as valid today. Also like the lion, these hunters depend upon healthy and well-managed deer herds to make their hunting adventures successful. 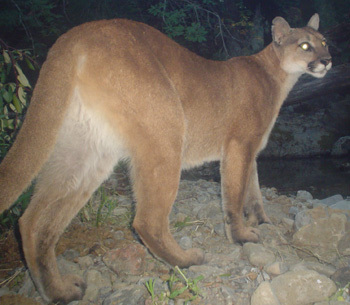 Unlike mountain lions, these hunters are bound by many laws that limit take and insure public safety, laws that are important. If Alameda County’s rich hunting heritage is to live on, steps must be taken to cultivate a climate in which hunters can survive. That means protecting the remaining large blocks of contiguous habitat and opening up public properties to limited hunting. Or, like the other endangered species, an American culture will disappear from our midst, leaving us all further removed from the outdoors and more susceptible to encroachment upon our remaining wild places. Once we remove people from the outdoors, the outdoors will be gone forever and nobody will know the difference. 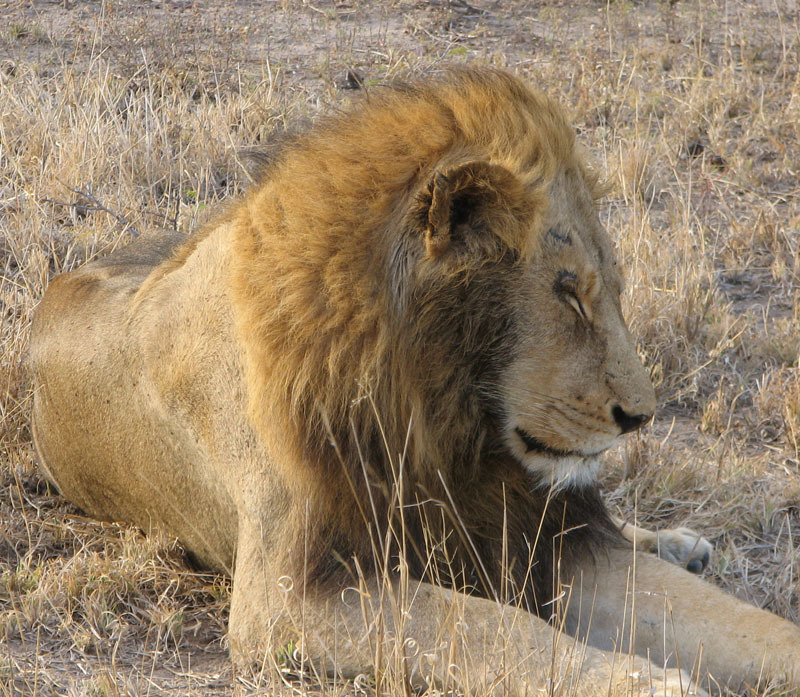 During our trip to South Africa, we spent four days at Nagala Tented Safaris and we had numerous encounters with the king of beasts, both male and female. On one occasion we followed a male lion at night and watched him roar from about 15 yards away. A lion roar is a spectacular event when that close. The vehicles were open on all sides so we had a great view. Elephants were not difficult to find. These two posed side by side while enjoying a drink at a pond fed from a well. Water is in short supply during the dry season. 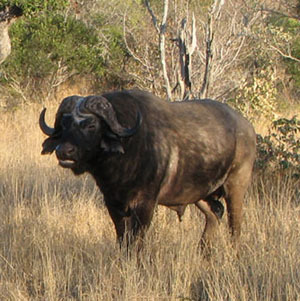 We photographed this cape buffalo from the vehicle, but on one occasion, as we walked back to camp with our guide we accidentally approached to within 30 yards of a dugga boy like this one and carefully backed away. I don’t think he ever saw us. 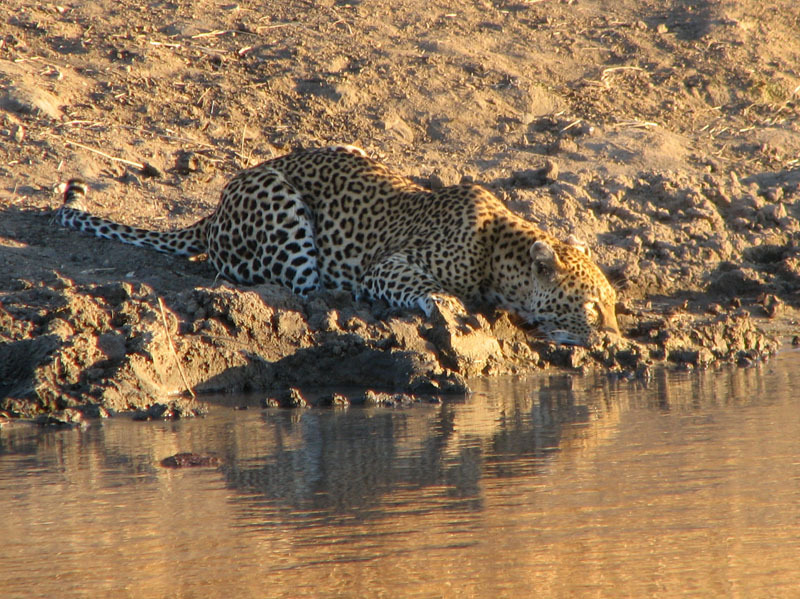 While we watched hippos, this leopard arrived at the pond and had a drink. We followed her for about an hour and she ignored us while hunting. Her two cubs were asleep in the nearby bushes. We had observed and photographed one of her young on a previous outing. The rhino was pretty boring, but the oxpeckers sitting on top of him were amusing as they hopped into and around his ears. During 2003, thinking it was a good time to buy a property to suit my own investment needs, I scoured the multiple listing service for an attractive buying opportunity. On one occasion, I found a property that seemed to be listed below market value. The property listed was advertised to be a 32-acre site with county road frontage. The price appeared to be too good to be true. Knowing that good opportunities don’t last, I jumped into my car and drove to the site. No “for sale” sign, no indication of what was for sale. I made a mental note of what appeared to be the subject property and contacted the listing broker. He quickly explained why the price seemed low. It was not an independent parcel. The owner was looking for a buyer who would step in to obtain a variance and subdivide his property so that the 32-acre listed parcel could be purchased. Knowing that this was something I might be able to accomplish, I made an offer to purchase the property and set the offer up so that I could buy it without using a lot of my own cash – always an important issue when you’re a real estate broker. Cash flow is usually the biggest problem when you’re self-employed. The property was listed for $325,000. I asked the broker to represent me as my agent and offered $260,000 with a $500 deposit to be increased to $5,000 after a variance for the lot split was approved. The owner would carry 50% of the purchase price at close of escrow and the note, with annual interest only payments at 6% interest, would be due three years after close of escrow. The seller accepted the offer. It turns out there was more history on this property than I knew when I made the offer, but I was satisfied with my opportunity and proceeded to make application for a variance that would allow the property to be split. The unique circumstances surrounding the parcel led to an approval of the lot split. But, it was a lengthy process that took over a year to complete. The issues surrounding the process were quite interesting and make a good story, but this is about what happened next – after the approval. Since I intended to sell the property to make money anyway, I was more than willing to sit down with them to discuss their intentions with hope of selling the property quickly (and for a profit). After a cordial meeting between me, my attorney and park district representatives, I delivered a comparable sale to the park people, via my attorney. The comparable sale was a 20-acre parcel that had sold for $695,000 more than a year before my purchase. I didn’t say exactly what I wanted, but my intent was that $695,000 would be about right. I was shocked when their official response was that they would pay $300,000 and that they would commence condemnation proceedings if I didn’t sell “voluntarily”. They showed me their appraisal in an attempt to back up their offer and were using my purchase price ($260,000) as a key element of it. Needless to say this put a crimp in my long-term goal (selling the property for a profit). My original purchase price of $260,000 was just the beginning of what I had into the property. Between the original offer and when the park district made their offer (about a year and a half), several things had happened. First I had taken on a silent partner who agreed to pay $175,000 for a 50% interest in the property ($350,000 for the whole property) while explaining to him that the property would be worth at least $550,000 once the approval was obtained. The reason I had sold for that price was because I’d covered my original investment (reducing my risk) while retaining the ability to make more money when we made the final sale of the property a couple years down the road and I didn’t have enough cash to continue this lengthy process comfortably. Therefore my partner would take a loss if I accepted the park offer. Not only that, but my investment had grown during the approval process and I’d also drilled and paid for a test well to the tune of about $10,000 before taking on the partner. But, most importantly, the property was worth the $695,000 price supported by my comparable sale. It wasn’t long before I began looking for an attorney who specialized in condemnation cases. I was not surprised to find out that the condemnation attorney would want to be paid 20 to 35% of the amount of the gain I would receive by going to court. During our fee negotiations, my attorney could see that this was a good opportunity and took a percentage at the lower end of the scale. At 20%, he ended up making the difference between $730,000 and $300,000 or about $86,000. I also paid my appraiser $15,000. As the initiator of this process, the park (tax payers) paid most of the other fees, such as court costs. I don’t know what their (tax payer) total expenses came to, but I’m sure it wasn’t cheap. In May of 2005, the park took possession of the property. I hired my condemnation attorney in July of 2005 and the case was heard in June of 2006. After the jury had spoken, the park paid interest on the unpaid balance of the purchase price at 3% per annum from the date they took possession until I was paid in full. I was upset enough about what I considered to be bullying by the public agency, that I refused their final appraisal price of $625,000 and all their ensuing offers including one for $700,000 a couple days before the trial started. The fact that they had raised their appraisal price from $300,000 to $625,000 (using the same sales data) was an indication to me that they had not been dealing in good faith. And, because my attorney fees would be the same whether or not I went to court, the resulting jury award produced the largest sales net of any selling opportunity afforded me. Although the week of sitting in front of a jury was frustrating, the satisfaction I received by having my day in court outweighed the pain of trial. Having received a public decision by a jury of peers, the information about my case is public information. If I had accepted a settlement, my guess is that the park attorneys would have required me to sign an agreement not to speak about the case, which in my opinion included bullying and hardball by the park after I had made a fair and good faith offer to settle – which would have saved the public a lot of time and money. Not all condemnation cases are so distasteful. In fact I’ve witnessed public agencies that behaved fairly and above board while exercising the power of eminent domain. It’s just a mater of who you’re dealing with, how much money they have and sometimes property history. MDF President and CEO, Mile Moretti and his wife, Julie, will be in attendance at our March 14 event this year. Miles has now been on board for a couple years and we are seeing good results based upon his efforts. Come to the banquet and take time to say hello, he’s very approachable and interested in hearing what our members have to say. The last year has been productive for The Mule Deer Foundation. The Western Hunting and Conservation Expo concluded last month and (according to my notes) after the smoke had cleared, MDF had generated somewhere in the vicinity of two million dollars for conservation. Much of the money was generated by sale of conservation deer tags in various western states. Other money was generated by generous donations by our members and supporters. The MDF Board of Directors also made significant progress this year by creating a mule deer endowment account that now has over $325,000 pledged to it. Until this account holds $2,000,000 the interest will accumulate. After reaching $2,000,000 the interest from the account will be dispersed to benefit mule deer programs. This is a major mile stone for MDF and the account is ready to accept your contributions. A the WHC Expo Saturday night auction, the Utah Governor’s deer tag sold for $187,500 – a new record for sale of a deer tag. At the Livermore-Pleasanton 2008 banquet, we’ll be auctioning two tags one a California Open Zone deer tag and the other a Wyoming Governor’s deer, elk or antelope tag. Our banquet proceeds in Livermore from last year’s banquet (including membership money and tag sales) produced approximately seventy thousand dollars net income for the support of MDF. Some of that money is used to promote and educate our members about mule deer primarily through publication of MDF magazine. Other money is used to pay the salaries of MDF staff, establishing new chapters and conducting national programs. Other staff members are working at headquarters in Utah to provide support for mule deer programs throughout the west, service our members and represent MDF as we interact with various agencies that control mule deer habitat. Over $10,000 of the proceeds from our banquet, remain under direct control of our chapter committee and will be used for California Projects. One of the projects being selected for funding this year is efforts by CDFG to restore habitat at the Hallelujah Junction Wildlife Area where a huge fire devastated many thousands of acres of deer habitat last year. Another project enthusiastically supported by MDF has been the Fresno County Fawn Mortality Study, also known as the Round Valley Deer Herd project. The Round Valley deer herd is comprised of two components, one that migrates to the eastern side of the sierras and another that migrates to the western side of the Sierras. For many years, the herd migrating to the western side has been in decline and scientists have been unable to determine the cause. The most recent adaptations to the project have been to develop a way to track the deer of this herd with GPS collars and vaginal implants for does. This allows scientists to track fawns from their birth and is producing new information about mortality of west side fawns. With help from MDF, CDFG may soon be able to post real time information about these deer on the MDF web site (www.muledeer.org) for our members to follow. MDF has also been supporting The California Outdoor Heritage Alliance, a 501c4 organization that is lobbying for hunters rights and also helping MDF with various legislative issues related to conservation. Also at the state level, MDF is working with the Fish and Game Commission and Department of Fish and Game to create public input and oversight on Department expenditures, especially as they relate to dedicated deer accounts. It’s always a challenge working with bureaucracies, but we are making progress and MDF efforts will result in improved funding for deer programs. As State Co-Chair for MDF in California, I’m taking the initiative to lead an effort to create a five-year plan for California deer. We have all the necessary ingredients to create a plan including CDFG, USFS, BLM and MDF. We’re just getting started on this, but initial inquiries have produced positive responses and we will also be seeking participation from other willing non-profit conservation groups. Please have a good time at this year’s banquet and do what you can to support MDF. The water was cold and my bare feet were barely touching the slime mud on the pond bottom. Somewhere beneath or beside me was a 200-pound boar that had sunk beneath the chocolate-brown water of the stock pond. I was surprised that the pond was so deep. I was only five feet from shore and the depth was already over my head. As I prepared to swim towards the middle of the pond, feeling my way with my toes hoping to bump into the hairy beast, something broke the surface of the pond out in the middle. It was our pig. Was it coming back to life? No, the gasses inside its body had finally caused it to float back to the surface. After a brief swim, we had our trophy. Why does a hunter swim for boars? That’s the rest of the story. 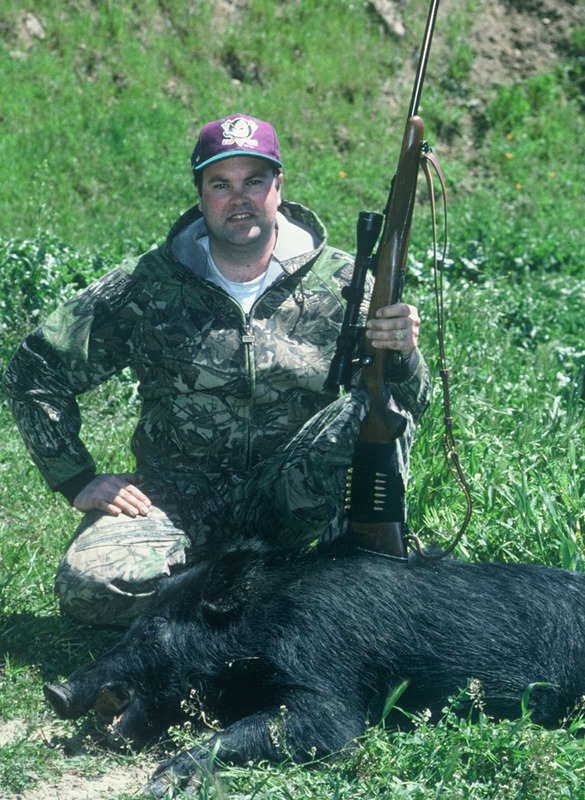 Tom Campbell and I had started very early in the morning, but we hadn’t found any pigs at first light. After glassing without success, we took up driving while searching for our quarry. Finally we came upon a boar crossing the road ahead of us. He headed into a draw following a fence line. I knew about where the trail would lead, so we hopped out of the jeep and climbed up on a knob overlooking a pond about 300 yards down the hill from where we’d seen the boar. We hit the jackpot as we ended up right on top of the boar and a bunch of other pigs all wallowing around at the edge of the pond. The range to the pigs was about 150 yards and Tom got prone and fired away at the boar. It was a clean miss, but the boar had no idea where the shot had come from. Instead of running away from us, he ran straight up the steep hill towards us stopping about 50 yards below us to look back towards the pond. That’s when my hunter friend unleashed a second shot the caught the boar perfectly. He dropped on the spot, but the hillside being quite steep, he began to slowly roll back down the hill picking up speed as he descended. By the time he reached the pond he was moving like a locomotive. At the edge of the pond he caught a little rise that catapulted him into the air sending him nearly to the center of the 30-foot wide pond. The splash was impressive and then he sank. It was a nice day in early spring, but not nice enough for swimming in muddy murky cold cattle ponds. At the time, it appeared that I had no other choice. If I’d had more experience along these lines I would have known that big animals float to the surface once they begin to bloat. Now I know. 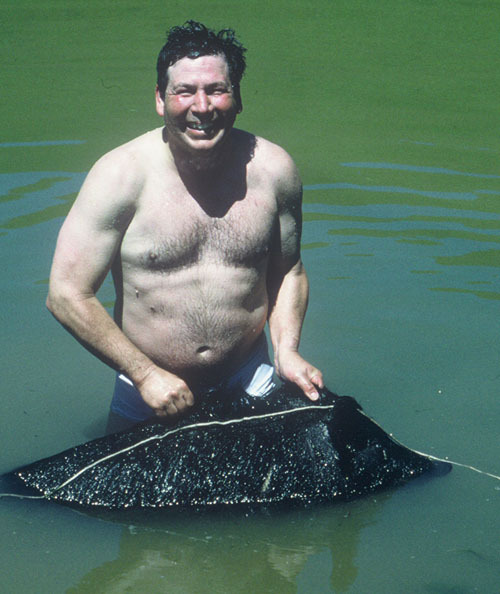 So, if your next big game animal happens to sink into a deep pond. Don’t swim after it. Wait for it. Sometimes good things sneak up on you like sunny-day November mallards. When you go to the marsh on those sunny November days, you don’t expect much. You know the odds of taking home more than a bird or two are slim. But for some reason, unknown to you, the ducks arrive in numbers. The drake’s green heads glimmer in the bright sun and the birds come to your calling. They don’t seem as wary and they give you shots you can hit. Your duck strap fills and you can’t believe your good fortune. Sunny-day mallards are the best of them all. But, to bag sunny day mallards, you’ve got to hunt often and have your share of empty straps as well. That’s the way I felt about The Mule Deer Foundation convention in 2008. I had no great expectations about the trip. 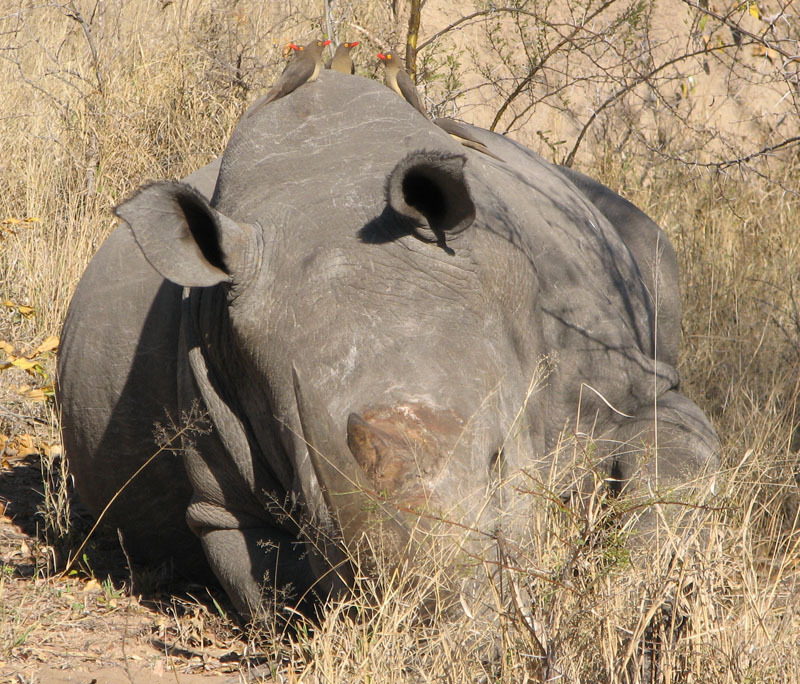 I hoped that it would provide me with energy and reason to continue to work for their conservation efforts. What I found was much like the flocks of sunny-day mallards that bring me back to the marsh. The members of MDF are big hearted and appreciate these events for the right reasons. They donate what they can afford, sometimes more sometimes less, but it’s meaningful. There are no big buck awards at the MDF convention. It’s not a contest to see who can spend the most money to impress the crowd. Yes there are those exceptions like the sale of the Utah Governor’s mule deer tag for $187,500, but the person who bought that tag phoned his bid in. The real “sunny-day mallards” at the convention are the people that just come to share good feelings about making a difference for wildlife. One of those is Alan Stuart. On Friday night after the convention events were over, I joined my good friends Jerry and Pat Lowery and Hal and Linda Stauff in the MDF hospitality suit. As we had not attended the last of the evening events, we arrived a little early, before the crowd. Tired from partying the night before, I was not expecting to last very long as I sipped on a bud light. A couple came in through the back door and approached the bar in a manner that let me know they were new. They had a European look about them and I was a bit surprised to see them. Not that they weren’t welcome, but we don’t get many foreigners at the MDF hospitality suite. Mule deer are for common folks and unlike some of the other successful conservation organizations, we don’t have a lot of interest from traveling hunters; that’s for the sheep guys and Safari Club. It wasn’t long before the couple approached the table where I sat and asked if the seats next to me were available. I replied yes, happy to have them aboard. They introduced themselves as Alan and Sue Stewart. As we struck up a conversation, I realized that Alan looked familiar. “Are you the guy who won the desert sheep-hunt raffle?” I asked. I think he blushed, but I couldn’t see it in the dim light. Sue was a bit more comfortable with the subject and she filled in a few of the details about the upcoming hunt. For those who don’t understand the significance of winning a desert sheep hunt, let me explain. Each year at the Wild Sheep Foundation’s convention, the Foundation conducts a series of drawings for sheep hunts. Raffle tickets are expensive, about $100 each, and the Wild Sheep Foundation sells many tickets with much of the proceeds going to conservation. The desert sheep hunts typically sell for in the neighborhood of $50,000. The reason they sell for so much is that they are in high demand and are very limited in number. Sheep hunters looking to take home one of each species of North American sheep are often wanting a desert sheep as the last of four species. The sheep hunt was Alan Stuart’s sunny-day mallard. As we continued our conversation, I learned he was from New Zealand and that he owned and managed a 10,000-acre ranch and hunting operation on the South Island. He farms sheep and red deer along with outfitting hunters for the many New Zealand exotic species. He claimed that his area was excellent for trophy red stags, and I believed him. The evening came to a close and we exited the party about the same time. I thought nothing more about the meeting until later the next day, when I realized that Alan might be a good source of a donation for our Livermore-Pleasanton banquet. Just before the show closed, I located Alan’s show booth. 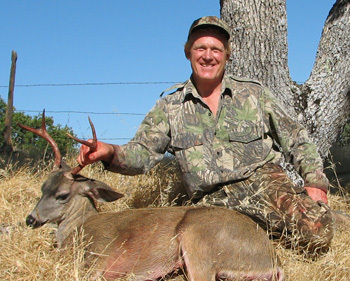 His company is called Leithen Valley Trophy Hunts. As I approached, Alan lit up and stepped over to acknowledge me. It’s always awkward, asking for donations, but I made my best effort. “I don’t want to twist your arm, but I’d like to know if you could make a hunt donation to our MDF banquet coming up next month,” I asked. I finally realized that not only did we have a hunt to help us raise money at our dinner, but also that Alan had donated it in a way that had minimized my discomfort and for that (and the hunt as well) I thank him. Alan and Sue’s web address is http://www.leithenvalley.com. While we were in South Africa last summer, the lilac breasted roller bird was with us constantly. 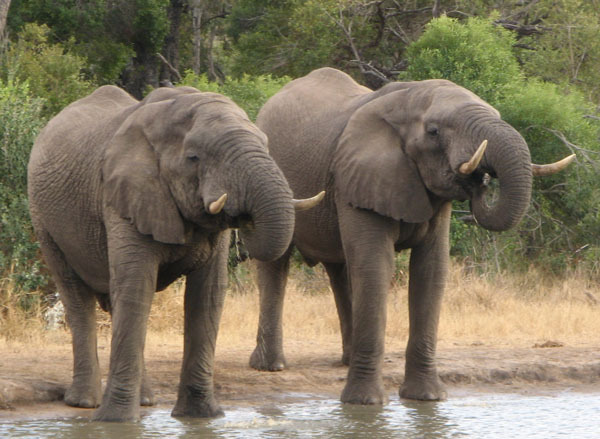 It was first mentioned by our guide at Kruger National Park. Then we observed it in the Limpopo Province while I was hunting. I attempted to photograph the roller bird on several occations, but lighting issues and failure of birds to cooperate doomed my efforts. During the drive to Sun City, roller birds made their signature roll beside the highway, causing their colorful wings to flash in the bright sunlight. 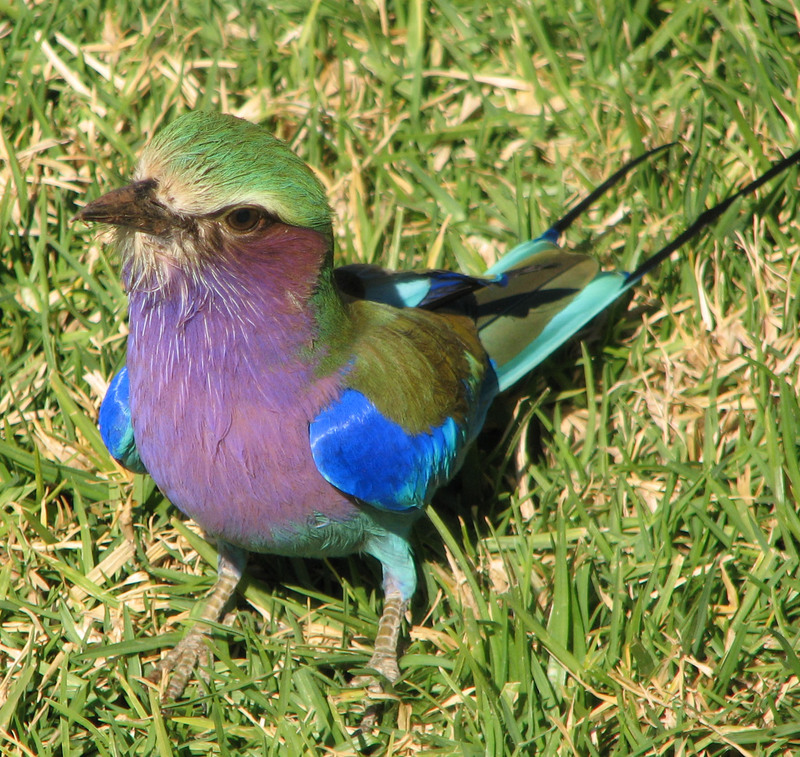 I had given up on photographing a roller bird, when I spotted one at the Gary Player Golf Course in Sun City. I grabbed my camera and walked out to the tree where it was perched. As I prepared to photograph the bird, it dropped from it’s perch and landed on the grass only a few feet from me. There it remained long enough for me to take two photos that came out quite nice. I guess it pays to keep trying.